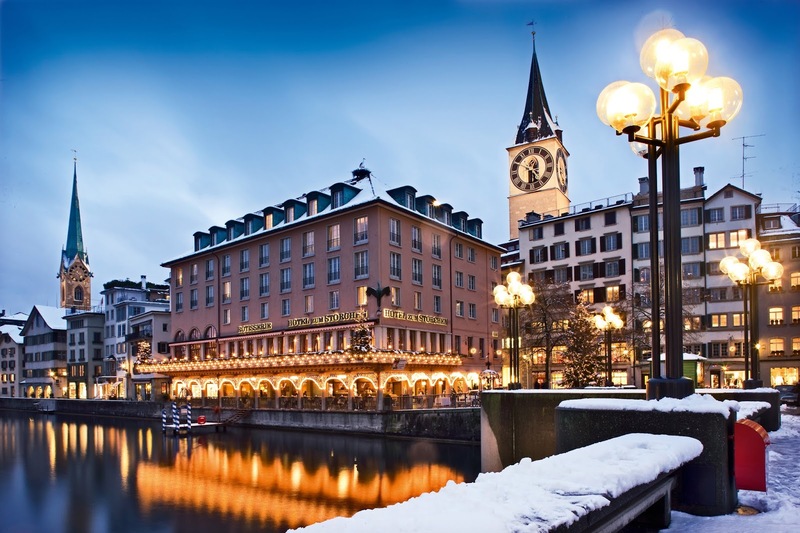 Last year I worked for a short while for a travel company who happened to have their Head Quarters located in Zürich - Switzerland's biggest city and thriving European business hub. One of the perks of working for an international company was the business travel that came with the job, so it happened that I was sent twice to Zürich in the cold wintery first half of the year. What a great kick-off to a travel-rich 2018! 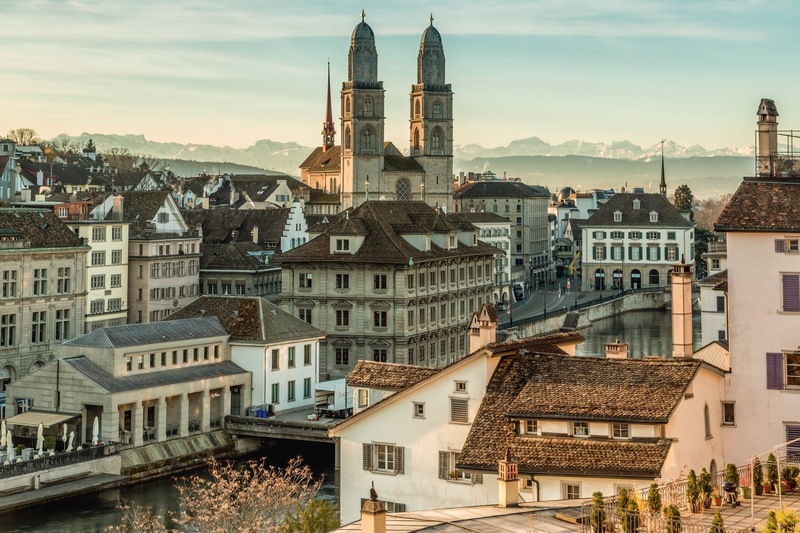 Many, many years ago I've visited Switzerland and I've seen Thun, Bern and the Wilhelm Tell Festival Games in Luzern - all beautiful cities that I remember fondly. There was no doubt, that Zürich would be as equally impressive and it did not disappoint. Whilst my main purpose was to go to work, I did have some time afterwards to explore the local area and city centre. It has to be said, that most cities in Switzerland are fairly small and moderately manageable in terms of sightseeing. Zürich makes no exception and it's surprisingly refreshing when you come from the chaos that is London to such a lovely spot in the picturesque Alps. It feels like you've stepped into a completely different world once you've stepped out of the aeroplane (Swiss obvs) after a 2h flight. Saying that to me as a German it always feels different when I go anywhere in the DACH countries so, in a way, it feels the same, cause it's the language and certain cultural aspects that I share with these nations, and then it feels different cause it's not Germany. However, I'm getting a bit side-tracked here because I wanted to tell you more about Zürich's compact size. The city is handsomely small and the city centre can easily be seen in a few hours. Everything is safe and walkable. It's a stark contrast to London where most of your time is taken up with travelling on the tube that equals a world tour. Zürich, on the other hand, is a city of short distances. My journey from the terminal building to my desk at the office located right at Lake Zürich took me 30 minutes. The journey was comfortable as well as Swiss value comfort and have high-quality trains (must be a German thing I reckon). In general, I got the impression that the quality of life is extremely high - the streets are impeccably neat, the houses have beautiful facades and people are very happy and friendly. A stroll along the city centre makes it very obvious, that this is a culturally rich and affluent city that has a strong economy and attracts a lot of international businesses. The Bahnhofstrasse is plastered with designer shops, people generally use bikes or walk which all contributes to a healthier work-life balance. All of that sounds amazing and thriving, however, the energies slow down dramatically after 6pm, when literally the streets are empty. Dead empty. And not just that. Living in such a high-quality paradise comes at a price and the tag is hefty! Switzerland is notorious for extensive living costs, so be prepared and don't let it knock you off your socks if your lunch amounts to £30 per person (easily!). £ Bakery Jung (Paradeplatz West) has some very nice German sandwiches, meaning seeded sourdough bread filled with salad and brie. Absolute delicious. You can also order a freshly pressed orange juice and buy typical German pastries. Sandwich and juice come £15, pastries around £5. If you fancy some quick and easy fast food, B.Good (Old Town, £) might be the place for you. They serve the usual sweet potato or chunky fries alongside build-your-own-burgers. It's usually pretty busy around lunch but luckily there's a high turnover so you don't have to wait too long for a seat. Costs included are around £16. A typical Swiss restaurant is Zunfthaus zur Zimmerleuten (Old Town, Limmat Ufer, £££) which serves Rösti, Cordon Bleu, Schnitzel, skinless pork (aka fat) and other savory dishes. Be prepared for a massive food coma afterward and a very slow processing since Swiss and generally German food is very heavy and takes a lot of time to digest. I ordered the Zurich Stew (Zürcher Geschnetzeltes) which was made from pork and came with a lovely potato Rösti. It was exactly what I needed after a long day at work and a cold -6 degrees outside. They do serve Fondue, however, they only do so in winter and only outside since the Fondue makes a lot of steam and smell which they don't want to have in their cosy restaurant chamber. Le Dézaley (Old Town, £££) was rated as one of the top-secret spots to go for Swiss Fondue by Easyjet Magazine so on my second visit I went there of course. 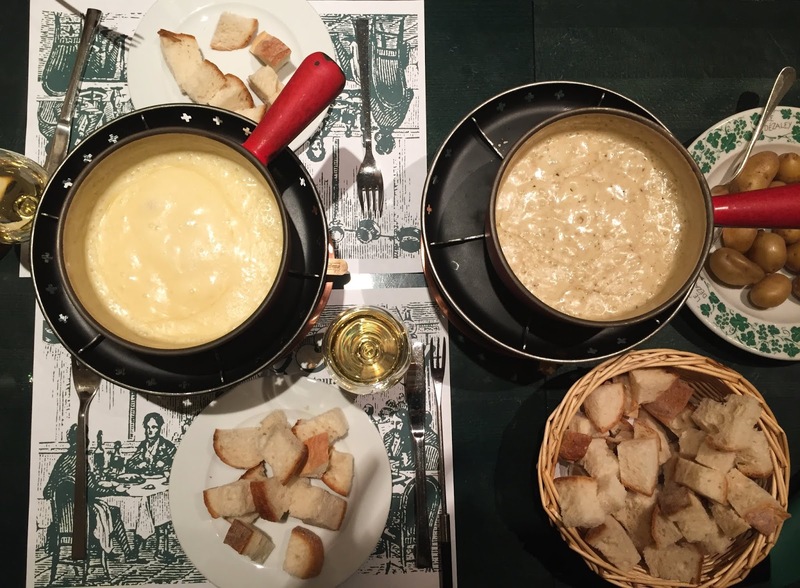 Together with my colleague, we ordered two sets - the classic traditional Cheese Fondue and a Black Truffle Fondue, alongside sliced bread. We've been seated by this lovely Swiss waiter who loved to talk to us and was fascinated to learn that I was German, living in London but working in Switzerland, so there was lots to talk about all evening. Fondue itself is quite the experience since you have open fire burner stations on the table to keep the cheese nice and smooth. The bread is a great addition as you easily overeat the cheese and might feel sick after a while, so having a slice of plain bread to clear your palate is actually nice. As dessert, we ordered Italian Pannacotta which was sheer heaven and super smooth with a lovely vanilla flavour. Another dining highlight in Zürich was certainly Australian restaurant Outback Lodge (Stadelhofen, near the Opera House). The restaurant is tucked away hidden in a back yard and only the many fairy lights outside hint at the entrance to another world - and it is an incredible atmosphere in there. In the summer (or in my case very early spring) you can even sit outside, literally under the stars, and enjoy amazing food. On my first visit I ordered their Bushtrucker Rolls (sweetcorn tortillas with lovely Australian chili) and on my second visit I went big and had Kangaroo entrecote with green beans, papadum and tomato salsa. Yum! Both times I loved the food and Outback Lodge was an absolute must for me. Yep, Australian food is absolute delish (£££). Switzerland has a variety of cultures and is a multilingual country hence why there are also many Italians living and working here. The best Italian restaurant as recommended by my colleagues is Don Leone (three locations, Waffenplatz). We had a team dinner after our social and ordered big time: we started with a sharing platter filled with burrata, ham and tomatoes, then went on to pizza, pasta, calzone, Dolcetto, arancini and pannacotta. I have no idea how much we spend in there but the atmosphere was lovely, the food very authentic and delicious and I would come back anytime (££). Oh, what would a trip to Switzerland be without tasting their world famous chocolate?!? The "Rolls-Royce" amongst Swiss chocolate is Läderrach and you'll find their shops frequently on the Swiss High Street. The chocolate is manufactured in big plates so when you go there you'll pay by weight (like when you go to the butcher) rather than by bar. 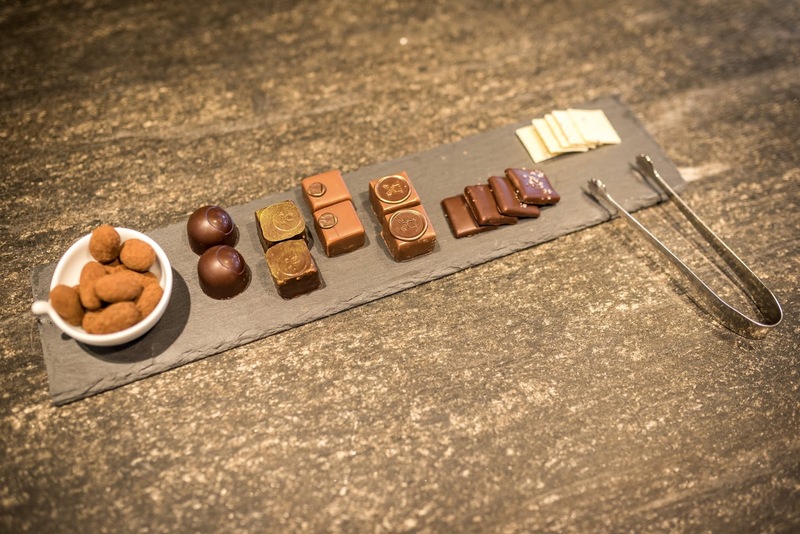 They have all sorts of flavours and combinations, and part of their success is the very smooth texture and a high portion of cocoa bean in the chocolate. A bit more down-to-earth but equally sophisticated is Sprüngli, which has several cafes in the city centre. Their chocolates are very nice and moderately priced. And then there's, of course, Lindt (to me overrated) and Kambly (try their mountain top biscuits). The city is surrounded by a breathtaking mountain scenery which is approximately 40 minutes by car away. You can go hiking and skiing or just enjoying the sun in one of the many chalets and Apres Ski cabins. There's also the Lake Zürich with its crystal-clear water. In the summer you can enjoy ice cream, go swimming or take a boat trip. In general, Swiss love their rivers and are very outdoorsy and inventive with watersports. The same applies to the river Limmat which ends in the Lake. Just before the bridge, there's a woman's lido and you'll regularly see people jumping into the river in the summer to cool down in their lunch breaks. Then there's the Opera House which is stunning at any time of the year but it is especially worth visiting in the pre-Christmas period when the markets are on. Then there's also the Old Town on the East-side of the river which is a pedestrian zone seamed with old, fairytale gingerbread houses, cute little alleys to get lost and independent shops. It feels like you've been transported back into time admiring all these medieval houses with its delicate facades. There are water fountains telling stories of the area and in general, there's a lot to see and to discover. You can also explore the area in the other direction, around the Opera House is a lovely path along the water to inhale some fresh air. For a perfect view over the town, head to the university on the hill. There’s a tower platform with awkward opening hours but also a viewing platform directly in front of the library - the Polyterrasse for a gorgeous 360-degree all-around panorama. The city is also well connected to the train line so trips to other cities, such as Bern or even Milan are possible. For a bit more action, I can recommend the Lasertag Arena (Waffenplatz). I've never done it before, nor have I been to play paintball, but during one of our team socials, we played two rounds of Lasertag and it was soooooooooooooo cool. You'll be given a laser cannon and wear an electronic vest. Once split into teams you are released into a dark labyrinth with lots of places to hide and the main aim is to "shoot" the other team. It's a lot of fun and actually a pretty good workout since you'll be constantly on the move. ....is the big question where to stay. Like everything in Switzerland, accommodation is rather pricey. The Old Town has some lovely small, independent hotels and on both of my stays, I resided at Hotel Rössli. The rooms are cosy and clean with a modern interior. The beds are super soft and usually, I'm having a hard time falling asleep in hotels, but here, I actually managed to fully relax. The location in the pedestrian zone of the Old Town guarantees a quiet night and there will be no sirenes or heavy traffic disturb the peace (some drunken people potentially, since there's a small pub downstairs). So there you go, these are all my tips and insights I can share for your trip to Zürich. It's a lovely place perfect for a weekender or city break in the pre-Christmas period or romantic trip for the upcoming Valentine's Day.